Mike Levine met Craig Anderton, who sampled three vintage Gibson basses to turn them into Cakewalk Rapture virtual instruments. Your third freeware of the week is a Rickenbacker 4001 bass sampled by Project16 and compiled in a plug-in by BigCat instruments. Dream Audio Tools announces the release of the Liverpool edition of its Repetitive Bass 3 sample library for Kontakt. ELBySoniQ is a new sound library developer which first creation is a virtual bass for Kontakt 5. Reality Bass, the virtual instrument plug-in developed Swedish Iridium Iris, is now available in VST and AU formats for Mac and Windows. Following the success of its acoustic and electric guitars, Ample Sound now models a Precision Bass. Cakewalk announces the release of the Gibson EB-5 String Bass expansion pack for Dimension Pro sampled by Craig Anderton. Together with pianos and drums, bass guitars ought to be counted among the instruments whose virtual versions can be considered credible today. Here's a selection of the best exponents in the genre. Spectrasonics released an AAX public beta version for its Omnisphere, Trilian and Stylux RMX virtual instruments. 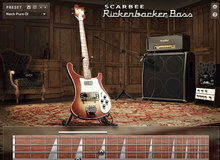 Orange Tree Samples expands its Evolution Electric Series with a Rickenbacker bass sample library for Kontakt.